SuperSport 6250mAh 5S 18.5v 30C is part of our new SuperSport range. This new range offers the same reliability and quality of the Sport range, but with an improved discharge rate, giving you more power for your models! 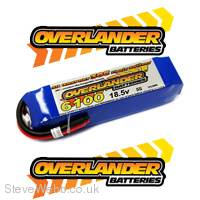 All Overlander SuperSport 30C LiPo cells are manufactured using the "STACKING" method, unlike many of the cheaper Chinese imports which are manufactured using the "WINDING" construction, a much cheaper construction method, with very limited discharge rates (15C - 18C) but often quoted as higher. Stacking construction is known for its longevity, and gives stronger more reliable voltage.